If the opener, “My Brightest Diamond,” in her dyed maroon bouffant, sequined gold shirt and gold lame trench coat didn’t tip you off, maybe her exuberant dancing did — this concert was sure to be an experience like no other. 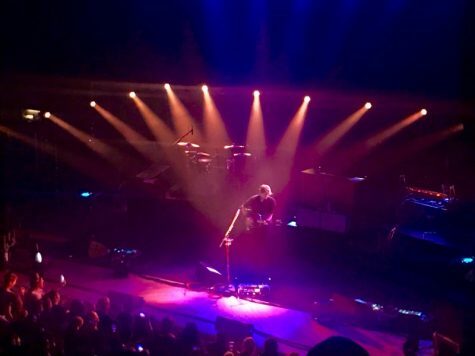 The Orpheum was packed far before the headliner Death Cab for Cutie walked on, with a nearly sold-out venue promising excited concertgoers and an infectious sense of anticipation as attendees listened to the lilting vocals of the opener. People were searching for a place to sit in the upper decks throughout the entire opening set, as a sit-anywhere policy had left nearly every desirable seat filled. You could almost feel the tension in the air — Death Cab for Cutie was going to be on in less than half an hour. The band came onstage to thunderous applause, with the crowd energy lifting after a pause of half an hour. It launched into “I Dreamt We Spoke Again,” off of its new album “Thank You For Today,” with no introduction. The band rotated between instruments seamlessly, with three guitars and one bass making an appearance at multiple times over the course of the night. Benjamin Gibbard, the lead singer, briefly took a pause to talk about how much the band missed New Orleans and how it had changed since it was last there. Taking the speech as a cue, Death Cab for Cutie launched into “Gold Rush.” The audience saw firsthand that the lead guitarist also served as backup vocalist. Clearly multitalented, he belted out the notes with a passion that was infectious. The lighting decisions were smart, with the design matching the mood of each song. The explosive songs were reflected in harsh bursts, and slower songs had much smoother, pulsating changes. Despite the mastery that the band displayed, however, energy started to flag close to 11 p.m. A concert this late on a weeknight was definitely starting to show in the crowd: attendees were engaged, but sedate. Despite the quieter crowd, the band kept up its energy. The crowd revived when the chords for “The Sound of Settling” started floating through the air, with those previously nodding now bopping along. As Death Cab for Cutie took its bows, the crowd gave the band a truly standing ovation, but the show wasn’t over. Gibbard came back on stage to sing the fourth-to-last song alone, a soul-rending acoustic version of “I Will Follow You Into the Dark,” a slow ballad that kept the crowd enthralled. At one point, he stepped out from behind the mic and the crowd sang the chorus alone, only accompanied by the plucking of his guitar. The final notes of the concert rang out after midnight, but the audience was bubbling with emotion as it left despite the late hour. The show was one that concertgoers were sure to remember.